I’ve eaten and made a few moroccan tagines and I think I have gotten to a stage where I have pinpointed the flavours I enjoy the most in order to maximise the experience when making it myself. dates) and some kind of nuts (preferably almonds) must be included. • If it’s lamb, cook it slowly in the oven so the meat becomes melt in your mouth. • Saffron adds all shades of WIN. • Cous cous, even when doing the quick cheating version, must contain butter. 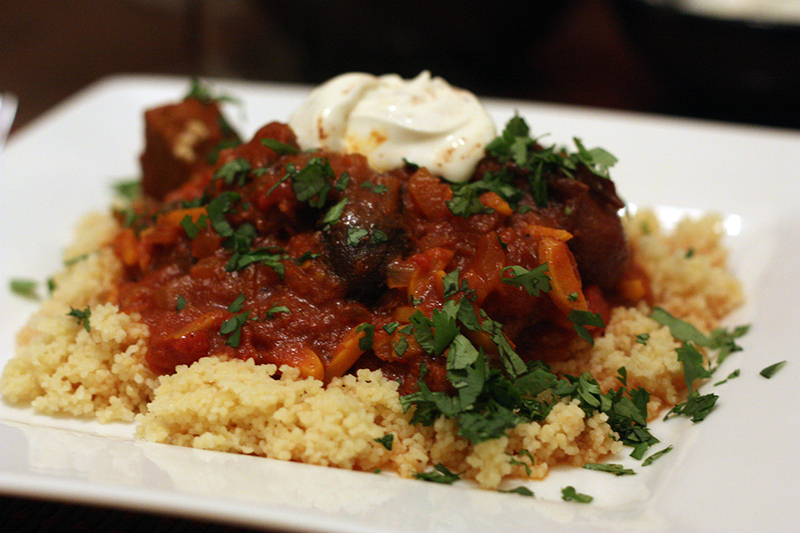 So this is the recipe for my latest tagine attempt. Mix together the spices at the start of the list, take half of this mixture, coat the lamb and refrigerate for 24 hours. Heat oil in a casserole dish on medium to low heat and add onion, other half on spice mix and garlic and sautée for about 10 minutes until onion softens but does not brown. In a heavy based frying pan brown the meat slightly on the outside. Add meat to casserole dish and deglaze the pan with a little passata and add this to the casserole dish as well. Add the rest of the ingredients down to and including the honey to the dish and bring to the boil. Place in oven preheated to 150ºC for 2 1/2 hours or until meat is tender. Serve with cous cous chopped herbs and a little labneh sprinkled with smoked paprika. Note: I cheated with the cous cous. I simply added 1 cup cous cous to 1 cup of boiling water and a knob of butter and wait until cous cous swells, fluff up and serve. Too easy.